Mines and Technology returns to Melbourne, alongside Australia’s largest mining conference and exhibition, the International Mining and Resources Conference (IMARC), taking place from 30 October to 2 November 2017. Bringing together more than 3,000 decision makers, mining leaders, policy makers, investors, commodity buyers, technical experts, innovators and educators from over 60 countries for four days of learning, deal-making and unparalleled networking. This year’s event will centre around the theme ‘Creating Value Through Collaboration’ looking at IoT, data analytics, connectivity and automation. Also at the fore will be strategies for collaborating to optimise productivity, workforce up-skilling and industry capability development for best practice mines of the future. The free exhibition will showcase more than 100 of the latest innovations, technology and services for the mining industry. Please click on the register link in the Contact Details to claim your FREE expo pass or receive 10% off when registering with the discount code MA1070TECH. What are the prospects for gold and other precious metals? That's the question a diverse group of miners and experts will seek to address at the upcoming International Mining and Resources Conference (IMARC), to be held from 30 October to 2 November at Melbourne's Convention and Exhibition Centre. 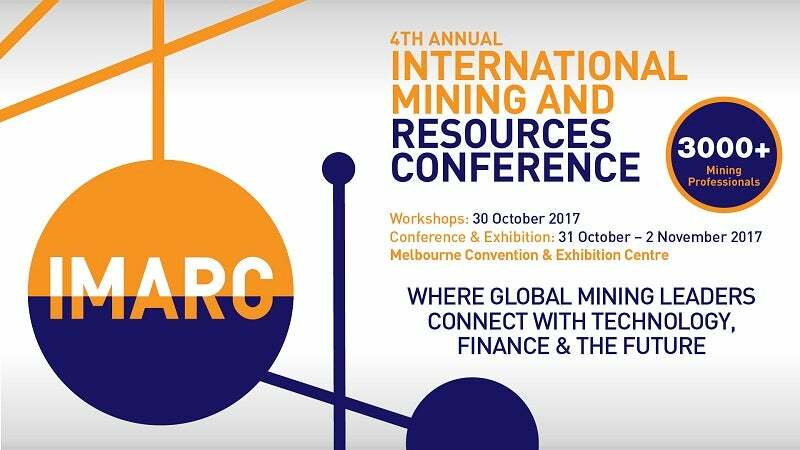 Some of the biggest names in mining and resources will share their knowledge and experience with delegates at the 2017 International Mining and Resources Conference (IMARC) in Melbourne from 30 October to 2 November.